I didn’t learn to drive until I was 29 and living in California. I had managed pretty well without a car until then. During my university years, I spent practically all my vacation time working at a fishing camp accessible only by boat. One year when I spent a week at home, my father gave me a few driving lessons. However, he lost interest when, while practicing backing in a field, I indented the shape of a tree trunk into the back bumper of his car. Public transport worked just fine for my job in Christchurch, New Zealand, and for getting around when we lived in England. When my husband bought a Triumph Herald for his commute to work, I had twinges of conscience that I should learn to drive it. But then we’d take an excursion into London, and the huge traffic circle at Hyde Park, with its multiple lanes and multiple exits, would do me in for another six months. Tony has been out car-hunting tonight. 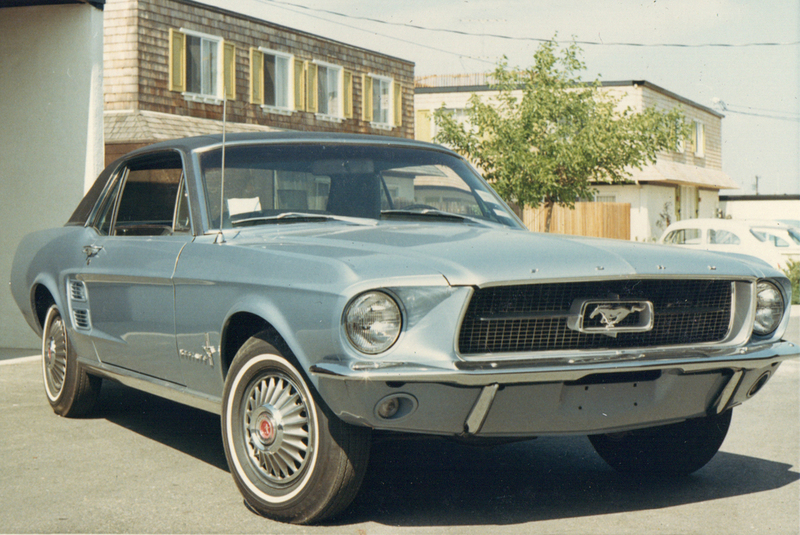 He has been driving a rented Ford Mustang, & has been so pleased with it that has decided to buy one for himself. Here there is no fixed price for new cars – it’s a sort of Eastern market of haggling & bargaining, & a buyer’s market at that, so it’s a matter of going round the various dealers to see what they will offer. I have passed the written part of my driving test. Margie Mandeville (neighbour with whom I have got very friendly) took me down to the Dept. of Motor Vehicles on Friday morning & looked after the kids in the car. Quite a good system – before you start learning to drive you have to get an instruction permit, which requires passing a written test on the Highway Code, & eyesight test. I’m a bit apprehensive about starting lessons, but guess I shall get over that. My driving lessons are going quite well – I have an hour nearly every day, will probably take my test later next week. Very concentrated course, a bit of a strain, but am apparently managing quite well. I am now the proud holder of a California driver’s license – passed my test this morning, with quite a good mark, considering nervous tension – 81%, passing grade is 70%. Quite a sensible system – you start off with 100 points, & get docked a set number of marks for each kind of error. Mind you, Tony passed the test the other day with 95%! Anyway, I am feeling very pleased with myself. I am now itching to get my hands on the wheel of that Mustang – Tony has promised to let me have a go at it, provided I don’t mash it up. As I learned on a Mercury Comet, which is slightly larger, it shouldn’t be much problem. 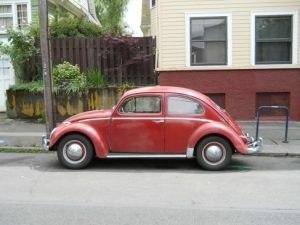 We are also going car-hunting for an elderly VW for me – they are very popular around here & have a good reputation for reliability & dealer service – this is a problem with many imported cars. What do you think, Dad, about maintenance costs on a VW of say, 1958? This is available at about $500; compared with a 1964 at about $1,000 (can’t afford anything more recent). I am really looking forward to being more mobile, & Tony is too – he finds weekend shopping a drag, when we could be swimming or sunbathing or going somewhere interesting. 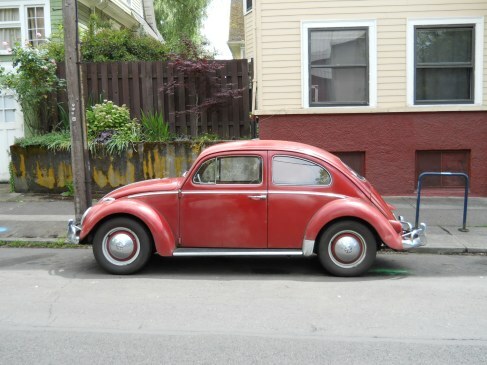 I have been having fun playing with my new toy – a bright red 1961 VW. It is in very nice condition, & the engine runs beautifully – the dealer had just spent $200 on it, including a big valve job – I gather that this is the thing most likely to go wrong with these VWs. It seems your advice to go to a VW dealer is just as valid here, Dad – is it true that they are responsible for getting the car into decent running order before they sell it? We took it out & checked it for all the usual faults, could find nothing wrong but a non-functional speedo, which Tony fixed with $2 worth of cable, & talked them into throwing in a new set of tires. Tony is going to take it into an auto-probe centre next week & have it thoroughly checked out, but so far we are very happy about our $850 worth. I have had one lesson from the driving school, & managed the gear shift quite well, & now it’s just a matter of practice. I have been getting in a bit of practice on the Mustang too – just as well, as we landed up in East San Jose on Sunday, buying this car (left the kids with a babysitter) & finished up with two cars to bring home, so I was landed with the Mustang. There seemed an awful lot of car for one scared little me – much more than when I had someone with me, but quite enjoyed myself once I got over being scared. I loved my little bug. The upholstery was torn, so I made slipcovers from brightly striped canvas. I quickly mastered the freeway system, and went everywhere I needed to go. It wasn’t until some years later, when we traded in the VW for a Mercury Montego station wagon, that I discovered some cars get more respect on the freeway than others. No longer was I being cut off by trucks, or prevented from making a lane change. Interesting, the social hierarchy of the roads. Golden fruit clings to leafy branches. Golden-skinned men climb orchard ladders, old metal harvesting pails in hand. 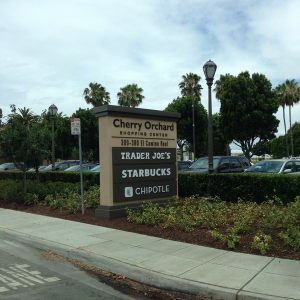 Close to the road, a huge billboard: FOR SALE FOR COMMERCIAL DEVELOPMENT. The scene has stayed in my mind, my first introduction to the landscape of my new home. 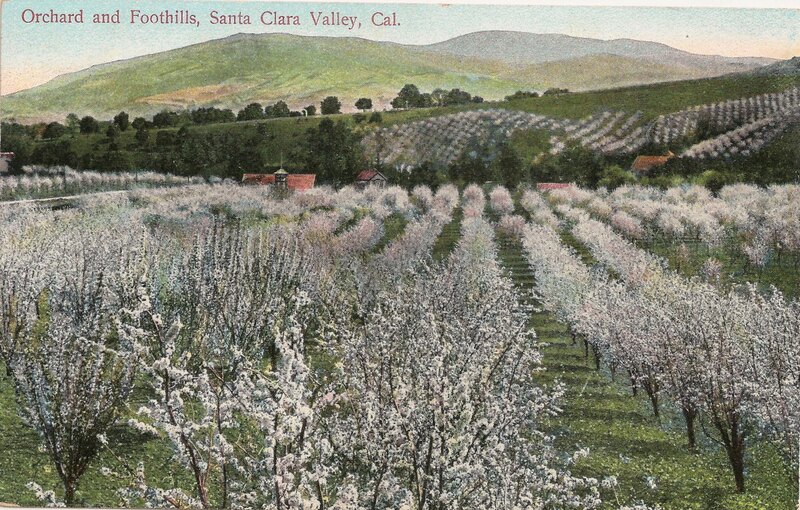 The field is bare now where the orchard stood. Apartment builders hammer at its brink. foraging through weeds by the highway’s edge? In recent decades, with the growth of the environmental movement, there grew a collective sense that something important was being lost. Efforts were made to preserve at least the memory of that fruitful landscape. 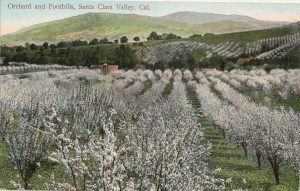 In 1994, the City of Sunnyvale preserved ten acres of Blenheim apricot trees “to celebrate the important contribution of orchards to the early development of the local economy” and created an interpretive museum beside it. 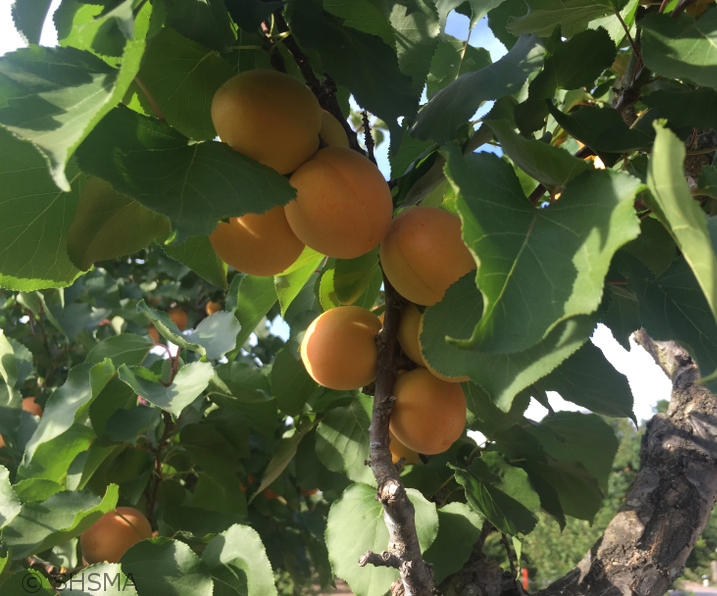 Blogger Lisa Prince Newman, whose family also moved to the valley in the 1960s, is collecting stories, pictures and apricot recipes from the few farming families still in the valley. Where 100 acres of cherry trees once bloomed.